I started this morning on the bus to work, in a Slack session, with some friends discussing buzzwords and edu memes. "Maybe we need to embrace the buzzwords but ensure their use is critiqued and their meaning and origin understood/explored?" Now arguably these aren't buzzwords, they're the vision of the NZ Curriculum. You know, the "world leading one". And I was mulling over how we do that, how we critique our use of these words and phrases and allow their meaning to be what they are, without being cynical or dismissive. Because in and of themselves, they're fine words. It's just that they're often used glibly - and that can cause negative reactions in those who they're used upon. She asked me, "Dad, how do I change colours in my knitting rows?" I had to admit I didn't know - that "my Mum never taught me to knit", so she said "Maybe I could find out on Youtube?" We turned on Google's voice assist, she asked "how do you change colour when knitting?" The first entry from Wikihow had too many words for her, despite the AI auto-reading it to her. The first video she tried was this one. After about a minute of watching, she was still confused. We watched from the start again, and I tried to explain it, but she declared that "This one's too hard." A minute or so of searching by herself and she decided that this video was much better. After watching it a few times, she proceeded to work her way along one row, joining purple wool to green wool, and was super excited when she finished. She said, "Dad, I was really frustrated at first, but I'm proud of myself because I kept trying and got there in the end." 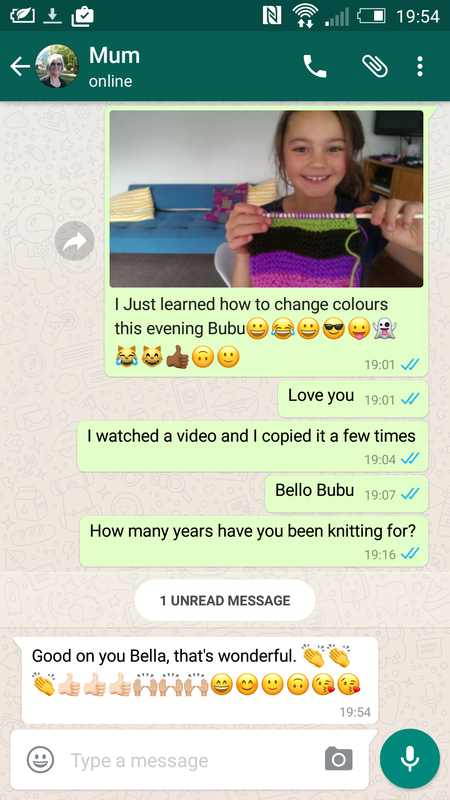 She wanted to tell her Bubu, so asked if she could use WhatsApp to contact her. I watched all of this unfold over an hour or so of an evening, and reflected on the fact that there's plenty in this tale that could be used to demonstrate the values and vision of that New Zealand curriculum, the Key Competencies and some of the edu-jargon we use. There's even an Ignite talk that could be had about digital technologies, personalising learning, using AI's and how they're all just tools to a learner these days. Of themselves they don't matter - that what they enable and allow matters. But mostly I reflected on how it's far more important for each of us, as educators, as parents, to pay attention and to look around, to value these moments for what they are. Our young people getting better. In tiny, discreet, amazing ways. As Ferris said, "Life moves pretty fast..."